Or what if your roof starting leaking? What if your AC went out? Imagine if the cost of a life changing event like giving birth would seem like more of a hiccup rather than a financial tornado when that $4,000 hospital bill rolls in. Having a fully funded emergency fund gives you that piece of mind when life throws you that curve ball, because it will. So What is a Fully Funded Emergency Fund? Since most people would take out a loan or put these emergencies on credit, you’ll be ahead of the game when you can dish out CASH. Not only will you have negotiating power by paying cash money, but you’ll avoid all interest charged. How Much Should I Save for My Emergency Fund? Knowing how much to save can vary between families. Honestly, it really depends on your lifestyle. Do you live life on the edge? Do you hop from job to job? Do you participate in extreme sports? Or do you live a modest lifestyle, drive a safe car, live in a safe neighborhood and don’t venture out too much? A modest lifestyle would need less savings in their emergency fund as opposed to an extreme lifestyle. I’ve read financial experts say to save anywhere from 3-9 months of expenses in your savings fund. Dave Ramsey recommends 3-6 months of expenses. So, 3 months of expenses is a good place to start and the very least you’ll need to have. 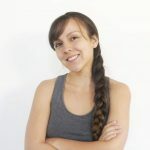 Do I Save 3-9 Months Worth of Expenses or Income? This is 3 months of EXPENSES. If you follow Dave Ramsey’s Baby Steps, the expenses will include your 4 walls (shelter, food, basic clothing, and transportation). The shelter part includes utilities to run the household so things like Mortgage, HOA, Water, Electricity, and Gas are included. The idea is that you want to be “forced” to get a new job and find new income fast. You should be cutting luxuries like cable, Netflix, Hulu, and memberships so that you can get afloat quickly. However, this is YOUR budget. If you want to include your cable, satellite, internet, or Netflix then do it. Just know that it will take longer. Personally, I include all of my expenses. This includes everything that I spend my money on. I don’t have Netflix or Hulu but I do have cable. I’ve figured out my Lifestyle Nut and multiplied it by 3. I chose to save for three months’ expenses because I would rather invest the rest. I don’t want 9 months of my money just sitting around. If something happened where I need more than the 3 months, I could always take it out of my investments. Chances are, I will probably make more money on my investments than in a high yield savings account anyway. How Do I Save Money for My Emergency Fund? The best time to save this big of an emergency fund is when you have paid off all or most of your debt. You will have freed up enough money to be able to fund this account fairly quickly. In order to stay on track and continue to save is to pay yourself first. This means, that before you make any payments to your bills, you’ll need to make a payment to your savings account. Figure out how much you will be able to put away. You don’t want to over estimate your savings and have nothing left for your bills. Then when your paycheck comes, put that amount directly into your savings and don’t touch it. In addition to the extra money you will have once your debts are paid, you may want to save more and make extra money. 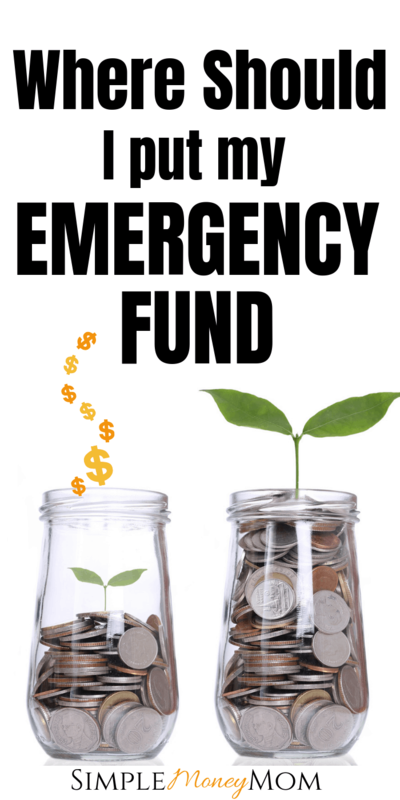 Your fully funded emergency fund could range anywhere from $6,000 to $24,000. This is a pretty big chunk of change just lying around. Most people have a regular savings account connected to their checking. But, there are 2 things I see wrong with this. One, it is too easy to access. Most traditional savings accounts are linked to checking accounts at the same bank making it super easy to tap into if you overdraft. Two, you won’t earn much interest on it. Banks earn an average of .01%, that means if you have $6,000 in there, you’ll earn $6, per year. You could be putting your money to better use. So where can you put this money? There are plenty of options for you. You may choose a Certificate of Deposit, a Money Market Account, or a High Yield Savings Account. In conclusion, I would recommend an online High Yield Savings Account. Interest rates are slightly higher than Money Market accounts right now and don’t require a minimum balance or minimum deposit. Your money will usually take 5 days to transfer if you connect it to your bank. So it is slightly liquid but not enough for you to use it on a limb. You may choose to have an ATM card but I highly advise against it unless you are extremely disciplined. I chose not to get an ATM card. Figure out which option will work best for you and your family. Many chose to go with a brick and mortar service with money markets because they like to speak with actual people. Others like everything to be online, like myself. Every family will be different but know that you have plenty of options. « Can Unplugging Your Devices Really Save Money on Your Electric Bill? This is great! We started this with Dave Ramsey and it really turned our life around!! Thank you Lindsay! We definitely have a better financial path by following some of his principles. Glad to meet another DR follower. Such a good tip! I recently talked a lot about this in my book as I truly believe people don’t realize how much this will save them WHEN unexpected things happen! Kashlee, I’d love to more about your book. That’s exciting. And yes, it amazes me how many people don’t have an emergency savings. I never had one either, especially not as big as 3 months’ worth of savings until I read Dave Ramsey’s baby steps. I was a believer from the start. Working in Trauma ICU as an RN, I see how life can quickly change and I have had friends whose lives turned upside down because of accidents. It gives me such piece of mind to know that I have something to rely on if something happens. Yes, Emeline thanks girl. It really is important when trying to get out of and avoid debt. Instead of relying on your credit card for emergencies, why not rely on your own hard earned money, right? I never would have thought to not keep my funds just in my savings account, great advice! Thanks! Samantha, savings accounts earn such LOW interest that it’s sad. If you are going to rack up a large savings, especially thousands of dollars, why not earn money on it without the risk? Some of the top HYSA and MMA are earning 1.65% right now which means that $5000 would earn $82 as opposed to $5 at a traditional savings account. Hi Betsy, some money markets can be competitive right now. But, I do feel like High Yield Savings Accounts offer a little more flexibility. If you have the discipline, I think it is great. But, if you are tempted to touch the money, perhaps staying with a MMA is probably best. Some of the top institutions right now are CIT Bank, Synchrony Bank, and Capital One. I would definitely look into those and see what fits your needs. Waow really informative and educative post. I learned so much. Funny how we take saving money for granted until the storm hits. Thank you for sharing this. Samuel, thank you. I’m so glad you found this useful. A savings account is extremely important in your overall financial freedom. Everyone needs something to rely on. Murphy will come knocking at any point in your life and it’s best to be prepared. Having a fully funded emergency fund can definitely help in that situation. My husband lost his job this past December, right before the holidays. I wish I read this then, but it’s still really helpful to read now. Oh no, Kat! I hope he finds a job soon. It’s always a stressful time when something like that happens. Prayers to you and your family in that your husband finds a job swiftly and you can get started on building your fully funded emergency fund again.